This annex gives two methods of deriving coefficients of active and passive pressure: charts and formulae. There is some confusion in the annex because the charts refer to K, and K , whereas the formulae use K and K .
The charts are taken directly from CIRIA Report 104, and are based on the work of Caquot, Kerisel and Absi (1973). Rather clearer charts, to a larger scale and b^sed on more recent work of Kerisel and Absi (1990) may be found in BS 8002. Both the charts and formulae relate to the components of forces normal to the wall surface (ie horizontal components if the wall surface is vertical). This contrasts with the published work of Kerisel et al whose factors relate to the resultant forces inclined at angle 8 to the wall surface. The terms used in the formulae will be unfamiliar to British users in two respects. a The coefficients applied to the self weight of the soil Ky and the effect of surcharges Kq are treated separately. However, these two values are identical for vertical walls, b The formulae do not directly distinguish active and passive coefficients. Rather, the equations are formulated so that active or passive values may be derived by changing the signs of some of the parameters. The numerical procedure provided in the annex is based on plasticity solutions. 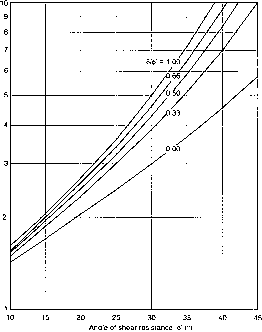 Results obtained from the formulae are shown for horizontal ground and vertical walls in Figures CG.l and CG.2, for active and passive coefficients, respectively. 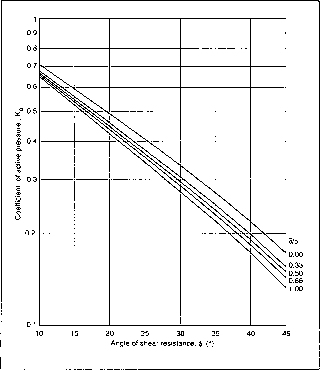 Figures CG.3 and CG.4 provide a comparison between the EC7 and the Kerisel and Absi results. Close agreement is found except for large angles of shearing resistance using high values of 8 / <|)'.